The following walks were provided via the Balfron Facebook page. Some are combined entries, so have been split. Thanks go to all the contributors. • We have what we call the loop in Gartocharn. It’s all on the road though unless you use the farm track which shortens it by half a mile. It’s about three miles and is a lovely walk/run. It by passes the entry to Ross Priory and there is a wonderful view of Loch Lomond on route. It’s sign posted. There’s probably is a map but not sure where to find one. From the village shop in Gartocharn, head towards Balloch for 200 yards, turn right and you will see signs for Ross Priory. Follow the road right round (It literally is a loop), and at the end, turn right again back into the village. Just watch last half mile as it’s on main road, that is why I use the farm track. • Along the Fintry road to Ballikinrain and back round into Balfron. I think going via the Honeyholm and coming back in via Boquhan was about seven miles but I’m not absolutely sure. If you go out towards the Honeyholm and turn right down the White Yett you can run by the river Endrick and come out just before Shearer’s garage. It’s not that far but it’s lovely and off the road mainly. 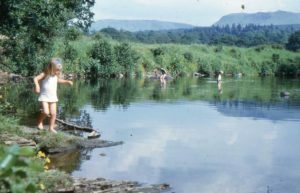 • Park at the bridge at ‘lama farm’, up to Black Hill crossroads, turn right to Killearn, turn right at tennis courts and down to Drumtian, over river and up to main road, turn right heading for Balfron Station, turn right into Balfron Station and head back to start. 5 miles, hilly, bit off road, bit of track and bit of busy road- fab wee route! 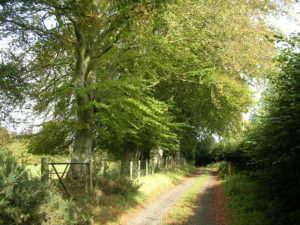 • Varying miles, with longer and shorter loops, but from Killearn run down Gartness Road or Drumbeg onto West Highland Way and follow to the field just past Beech Tree and cross field to Glengoyne Distillery. Cross road. Over wooden stile, then up the steep slope to the water track, turn left and follow back to Killearn. The longer route (from Gartness Rd) is 8 miles. • Several routes in the Queen Elizabeth Forest park. Maps in some of the parking areas. Try Loch Ard Forest just outside Aberfoyle. Really great walks that go in a loop. There’s a short, medium and long loop. Walks starting at Kinlochard into the forest all on map in car park. • There’s a variety or routes from Strathblane. From riding stables up past Boards Farm and you have many different routes up to West Highland Way, Mugdock Park, over the Moor, across to Cuilt Brae. A mixture of rough track, forest road, moor path …. or just head through the forest. Lots of lovely loops between Strathblane and Mugdock, mostly/ all off the road and good for walking, running, hiking, etc. Up track to Boards Farm then down to the Cuilt Brae and along the railway track. Along the water track between Blanefield to Dumgoyne and back along the railway track to Blanefield. Loads of great walks! • Balfron walk; by the bowling green, Tunnel Inn*, Yettes Glen, Roman fort back into the village. 45 mins walk. • Go up to the the David Marshall lodge – they sell a little book of the 40 top walks around the Trossachs. Most of the walks are loops and all mapped out so you can’t get lost. • Go to Killearn, walk down Drumbeg loan turn left along West Highland Way past Beech Tree Inn , turn left at Path towards distillery , over the road and up at the stile going up toward pipe track road and along to the Branziert or when the Spar road is open down there or through the woods and back to transport. • From Dalmary water house area and walk towards Aberfoyle but that is there and back. • Jenny Gunn’s Loan, through Carbeth Estate, up Drumtian Road to Killearn and back to Balfron. • Ballochruin Woods: There are are series of very short walks through the new plantation at the north side of the Ballochruin bridges. Dogs on leads during the breeding season; no dogs in ponds. Walking along the riverbank adds a few minutes to this walk. Best suited to small dogs. Not only is Scotland a fantastic country for enjoying the outdoors, we also have world class legislation which provides for public access to most land and water. These access rights apply widely to Scotland’s countryside and include walking, cycling and other non-motorised activities. Wherever you go, remember to take some simple steps to take care of the environment and respect the needs of other people working on the land or enjoying the outdoors. There are also some places where these rights do not apply, including houses and gardens and military bases and airfields. 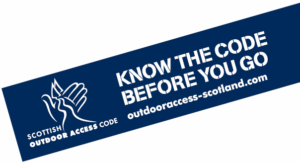 Full details of these rights and responsibilities are provided in the Scottish countryside access code. Tips on how to camp or when to keep your dog on a lead are just some of the topics covered. The Code also provides specific guidance for Land Managers and Recreation Managers.